Those with a keen eye will notice that Lionel Messi is not dead, nor has he ever been to the best of our knowledge. Indeed he’s very much alive. While you may be struggling to fathom why Fox had such a moribund announcement typed up and ready to go in the first place, let alone publishing it – it would appear that their Twitter feed was hacked, so no biggy. 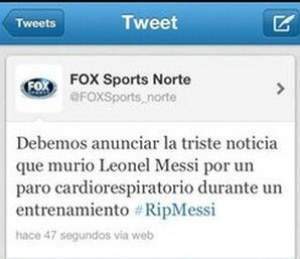 In other news, Ronaldo’s heart skipped a beat, then came reports that Messi was still alive.